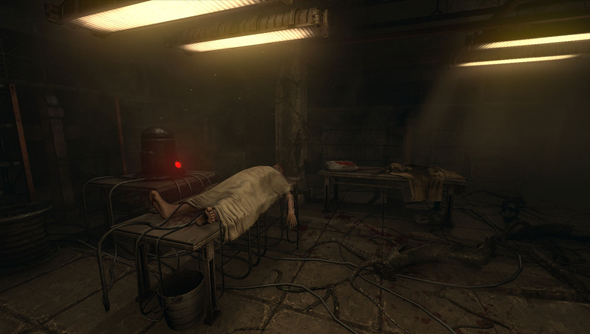 With Amnesia’s sequel farmed out elsewhere – inasmuch as anything can be ‘farmed out’ to one of the most creative studios in indiedom, thechineseroom – Frictional Games have spent the three years since the primal fear sim’s release building awful machines and dropping them, one by one, into a new bit of scare-bottling software. It’s another first-person exploration and survival game, called SOMA, and it’s destined for the PC in 2015. We found creative director Thomas Grip cowering behind an overturned plastic chair on thePlayStation blog, hiding from his own creation, which he warned us would “confront you with questions about your very existence”. It’s running, arms flailing, around the same thematic ballpark asMonkey Island-influenced platformer The Fall– though that’s a darkened field sparse and large enough that I’m sure they can both stumble about forever without ever colliding.